Bahamas Vantage College offers Associate degrees in programmes such as Computer Information Systems, Accounting, Business Administration, Hospitality and Tourism Management. These degrees are considered among some of the highest regarded programmes available. Also with two Bachelor’s degree programmes available, unique undergraduate students from across The Bahamas and around the world will choose BVC for its outstanding reputation, advantageous location, impressive faculty, rich curriculum, and online fast-track career advantages. 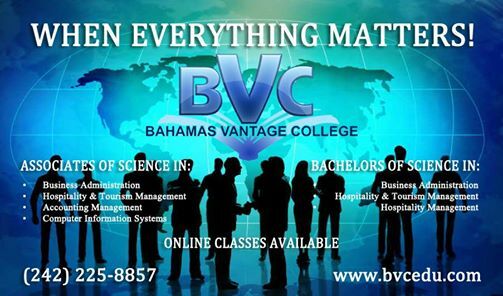 Bahamas Vantage College (BVC) currently offers six academic programmes that lead to an associate degree, as well as two bachelor’s degrees in Business Administration (BBA) and Hospitality Management (BHM) with a Tourism Management concentration along with various continuing education classes from its Professional Development Institute – traditional or online.